Paris is the most glamorous city in Europe. The city is very walkable and even the furthest sights can be reached easily by Metro or bus. The right bank- Arc de Triomphe, the world famous arch commissioned by Napoleon + the tree/shop-lined Champs-Elysées, and at the end of that avenue is Place de la Concorde, where the well-travelled 3,300-year-old Egyptian obelisk oversees the city's chaotic traffic. 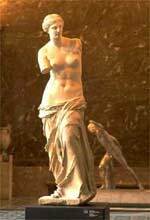 On the other side of the avenue, through the peaceful Tuileries Garden, you get to the incredible Louvre, a vast building with glass pyramid entrance, where 'Mona Lisa' still smiles. Other notable buildings are Opéra Garnier an imposing theatre], Centre Georges Pompidou [modern art museum], Sacré Coeur [Basilica of the Sacred Heart] with a monster white dome from where you can enjoy a panoramic view of the city. Then there's Les îles with Notre Dame - it's is well worth climbing the 387 steps for a breathtaking view of Paris and close look at some scary gargoyles. Conciergerie is a former prison where 3,000 guillotine victims including Marie-Antoinette were kept warm. The left bank - The Eiffel Tower , the 320m tower landmark of Paris is infamous for a long wait for the lift. An adjacent park, Champ de Mars is pleasant for picnics for weary travellers. 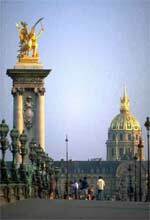 Another must-see museum is Musée d'Orsay for an exquisite collection of Impressionist works. The Quartier Latin, enlivened by students of the Sorbonne University, offers Roman ruins, Musée du Moyen Âge , Arénes de Lutéce, and two fine parks, the Luxembourg and Jardin des Plantes. A relatively new attraction is La Défense, a massive skyscraper group, including Grande Arche , with open-air contemporary arts exhibits in the west of the city. As the old song says, Paris is at its best in springtime, even if it is sometimes a little wet. In winter Paris has all sorts of cultural events going on, while in summer the weather is warm and lazy - sometimes sizzling. In August, when Parisians flee for the beaches to the west and south, many restaurateurs lock up and leave town too, but this is changing rapidly and you'll find considerably more places open in summer than even a decade ago. Things can get a bit hectic around Bastille Day and towards the end of the year so reservations at this time are a good idea. The Paris Métro is one of the world's best, even if it is among its oldest. In Paris, nothing is more than 500 yards from a Métro stop. Get one of 12 different Métro passes online (days/zones/adult/child) to bring you around the City. These passes can be delivered to you at home before you arrive in Paris, or at your hotel in the City. Individual Métro ticket is 8FF; packet of 10 tickets (a Carnet) is slightly more reasonable. Cost of RER tickets depends on distance traveled. Within central Paris cost is the same as Métro tickets, and the same ticket is also valid on both systems. Both the Métro and the RER (Réseau Express Régional) are run by the RATP - Régie Autonome des Transports Parisiens. The RATP also runs the busses. Whatever price you're looking for, compared to most other cities Paris is still a paradise for the weary traveler tired of dreary, out-of-date, or cookie-cutter rooms. The best hotels still emanate an unmistakable Paris vibe: weathered beamed ceilings, vaulted stone breakfast crypts, tall windows overlooking zinc rooftops, and leafy courtyards. Most Paris hotels charge extra for breakfast, with per-person prices ranging from EUR5 to more than EUR30 at the luxury establishments. Though hotels may not automatically add the breakfast charge to your bill, it's wise to inform the desk staff if you plan to have breakfast away from the hotel. If breakfast is included in the hotel rate, we denote this in the review with "Continental breakfast." Jan 1st, Grand Parade, massive and colourful. June, Fête de la Musique, thousands of musicians give free concerts of all kinds all over the city. end June, Course des Garçons, 8km race by waiters in full kit. 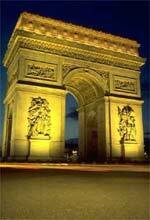 July 13/14, La Fête Nationale, Bastille Day, France's biggest street festival, with parties, parades, fireworks. mid Sept, Techno Parade, Paris' version of Berlin's Love Parade. early Nov, Marjolaine, huge eco-festival.